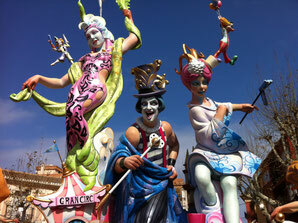 Every year the Fallas in Valencia is a huge event which combines art in the street with fire, gunpowder and traditions. It starts on the 15th of March with the "Plantà" a term in Valencian which translated means something like “finishing touches” and it's when the Fallas are completely finished in the streets. During several days you can visit these spectacular monuments and there are parades, the "Ofrenda" the flower offering, music, fireworks and not to forget the “mascletás”, an event that cannot be described and something you have to experience at least once for yourself. It all ends on the 19th of March with the "Cremà", the night that the monuments in the streets are being burnt. Except for the "ninot indultat": each year only one figure is being saved from the fire. As there is so much to see and tell about the Fallas, we herewith provide you a link to a website that describes it all: http://fallasfromvalencia.com Make sure to watch the videos or even better, come and visit Valencia your self this time of year!